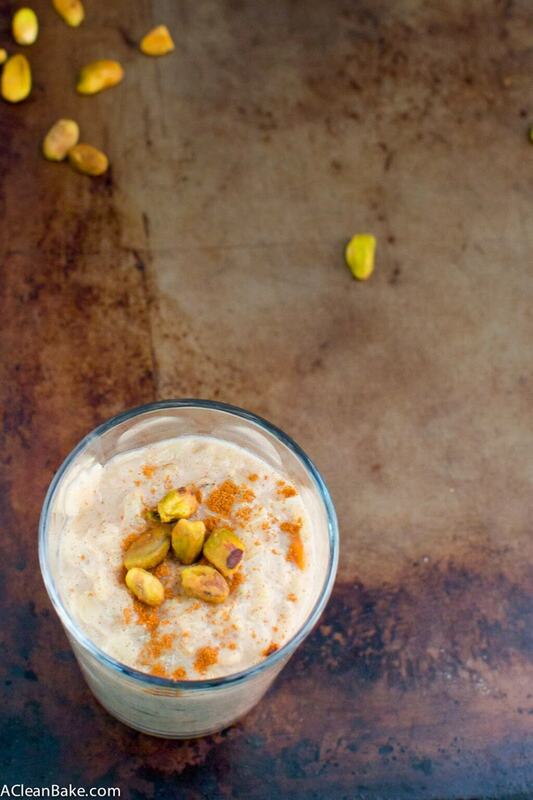 This pistachio orange rice pudding (with brown rice) has a healthier, whole grain twist and pistachio and orange blossom water for outstanding flavor! Rice pudding is one of those simple-yet-decadent desserts that everyone seemed to love except for me for most of my life. I finally tried a wonderful, homemade version that a friend made in college, and like so many other critical desserts that I had been missing out on, changed my mind. But it’s not for the faint at heart, calling for tons of sugar and cream, not to mention the rice itself, which is typically of the high-glycemic-index white variety. This version makes a few simple tweaks to eliminate the dairy, reduce the fat, increase the fiber, and supercharge the flavor. The most obvious way to make rice pudding healthier is simply to use brown rice instead of white. It’s easier said than done, though, since brown rice takes a lot longer to cook, which is why the recipe calls for pre-cooking the rice to al dente (tender but still chewy). 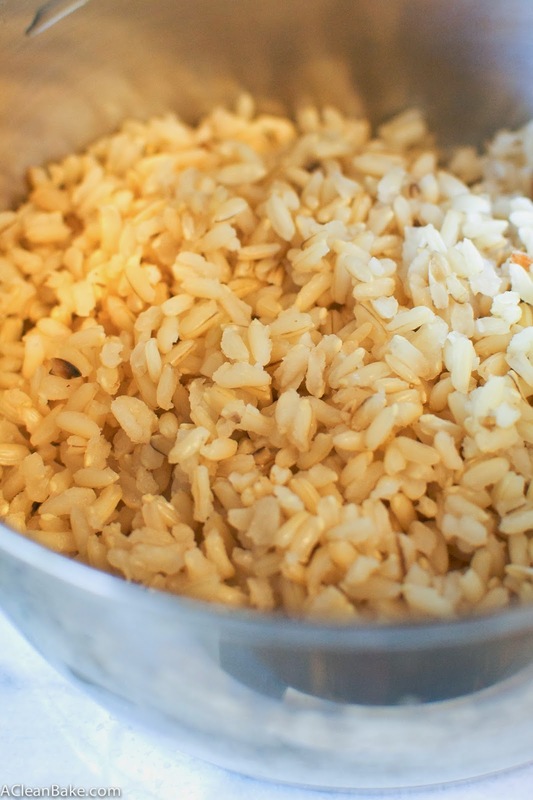 You can tell the rice is ready when the grain is just on the verge of opening, like the photo below. You’ll use almond milk instead of heavy cream. Almond milk is considerably thinner and less creamy than, well, cream, but don’t worry – the pudding will turn out as thick as it should. The par-cooked rice hasn’t released all of its starch yet, so as it finishes cooking in the almond milk, that starch will thicken the pudding on its own. But, for maximum creaminess, you can use (full fat) coconut milk or a combination of coconut milk and coconut cream instead. But, in the absence of fat, you get blandness – unless you replace it with some serious flavor. In this case, I used cinnamon – which is standard in rice pudding – and orange blossom water – which is standard in very few American pantries, I know. Orange blossom water, which is sometimes called orange flower water, is an aromatic liquid flavored by the oil of orange tree blossoms. It sounds stranger than it is. I am familiar with it as a common flavor in Moroccan and Turkish desserts, but it is a commonly used ingredient throughout North Africa and the middle east. It’s worth investing in a bottle since, as you can tell from the expiration date on mine, it lasts forever! 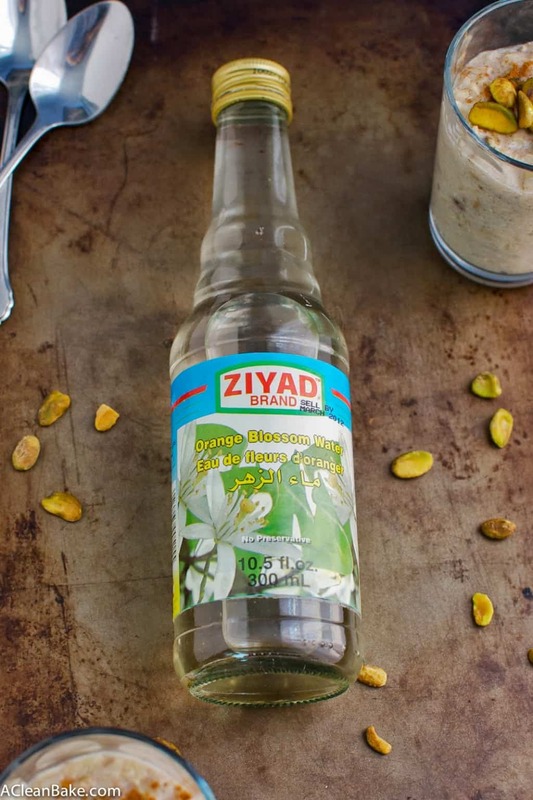 You can find orange blossom water in middle eastern groceries stores, online and, depending where you live, possibly also in the “ethnic” foods aisle of the supermarket, near the other middle eastern ingredients like tahini. If you can’t find this ingredient, though, you can easily substitute orange zest, which will give you a more familiar bright and citrusy orange flavor, as opposed to the more muted, flowery orange flavor the water lends. Either way is perfectly acceptable, and will go nicely with the cinnamon and pistachios. Today’s recipe is an ode to the Muslim celebration called Eid, which commemorates the end of the holiest month of the Islamic calendar, Ramadan, a time of fasting, fellowship and prayer. After so many weeks of daily fasting and prayer (…well, others, not me. I’m not Muslim, and I’ve been doing the opposite of fasting lately), a no-holds-barred gustatory extravaganza is in order. 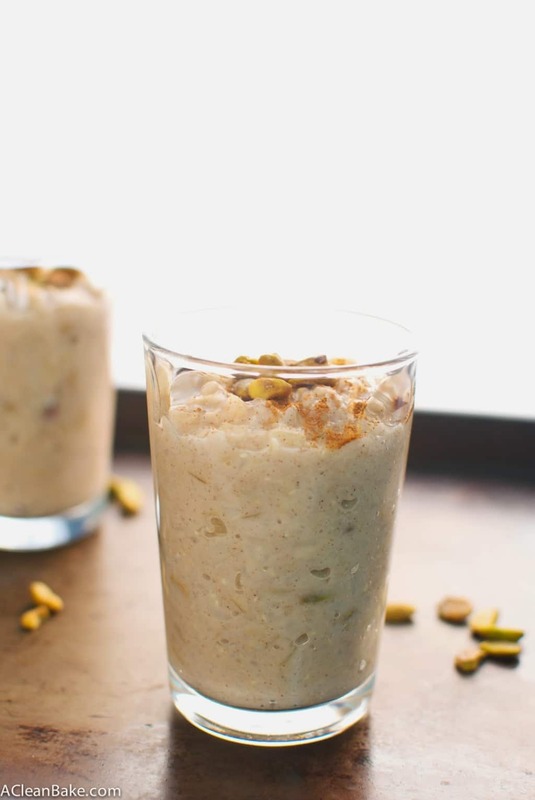 My research (aka Meriem’s expertise) tells me that rice pudding is a common dessert that is included in the Eid meal, alongside other pastries, puddings and sweet bites like almond paste fruits. 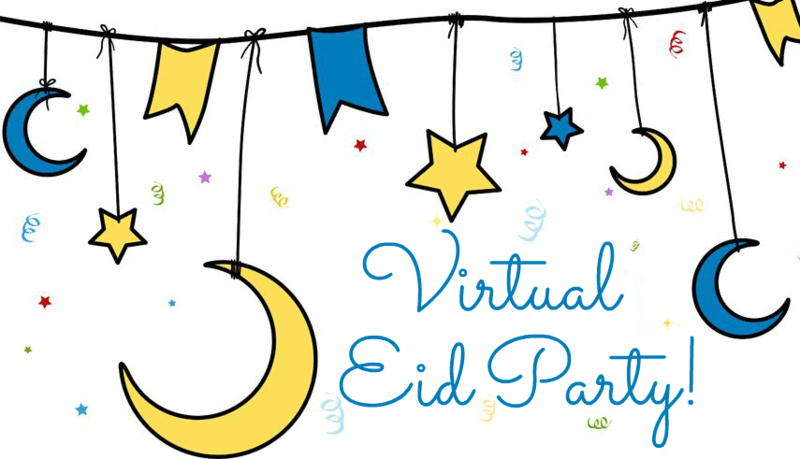 Given the wide array of dessert possibilities, it’s not surprising that when Meriem invited some of her blogger friends to a virtual Eid party, and we all brought desserts! Scroll down past the recipe to check out the rest of the recipes from the party. Combine the rice, milk, honey, cinnamon, vanilla and orange blossom water in a small saucepan. The milk should cover the rice completely. Stir to combine. Bring mixture to a boil, then reduce the heat to medium and simmer, stirring constantly, until the liquid has been absorbed enough so that the grains of rice have opened and the liquid is below the level of the rice. Turn off the heat, and add tapioca starch. Stir for 60-90 second until the pudding thickens. Then stir in the pistachios. 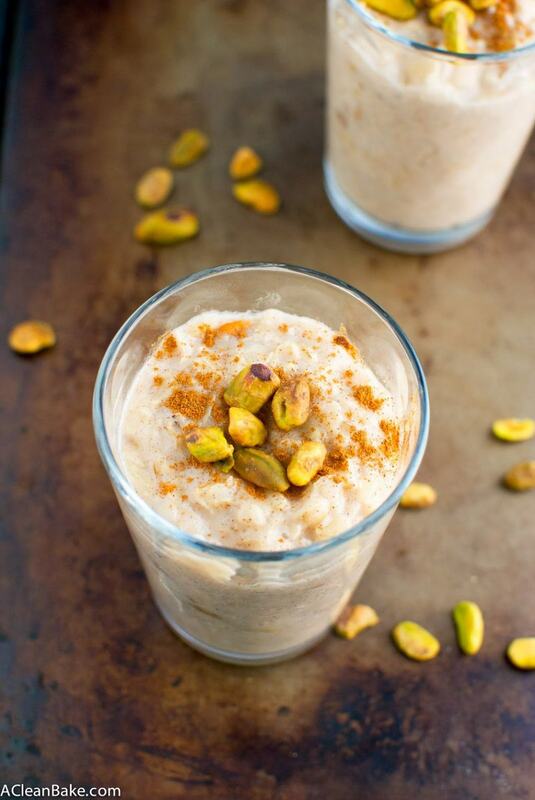 Let cool slightly, then garnish with additional cinnamon and pistachios before serving. Store leftovers in an airtight container in the fridge for up to a week; reheat before serving. (3) Most people are used to raisins in rice pudding. I did not add them because the brown rice is much chewier than white would be. If you want them though, add about 2 Tablespoons golden or brown raisins. This page contains affiliate links, meaning if you click through and decide to complete the purchase, I get a very small commission which gets invested directly back into supplies, ingredients, and administrative fees that are necessary to keep A Clean Bake running. Hi Mary – it looks like there was a glitch in the email this morning. Were you looking for the turnips recipe? If so, here it is: https://acleanbake.com/maple-roasted-turnips-with-bacon-and-crispy-shallots/ Sorry about that!